GIA announces the release of a comprehensive global report on Surface Mount Technology (SMT) Equipment markets. Global market for Surface Mount Technology (SMT) Equipment is projected to reach US$5.3 billion by 2018, driven by recovery in electronics and semiconductor industries, new product innovations, and growing need to upgrade older production lines. The research announced the global SMT Equipments market growth. SMT equipment market continues to derive demand from major downstream industry segments including telecommunications, computing and consumer appliances, which are the most prolific users of PCBs, according to a new report from Global Industry Analysts, Inc. However, the market in recent years has been gaining significant opportunities in other industries such as automotive electronics, medical device electronics, defense and aerospace electronic equipment, and industrial equipment among others. With end-use markets for SMT equipment shifting focus from defect detection to defect prevention, SMT equipment manufacturers are turning towards diversification of product offerings. Growing demand for high-quality SMT equipment from contract and OEM manufacturers is poised to benefit the market. In addition, rising demand for light emitting diodes (LED) technology is fuelling demand for SMT equipment. Driven by growing popularity of LEDs, SMT equipment manufacturers are ramping up their production capacity to address demand from commercial and consumer electronics sectors. Additionally, miniaturization of components is spurring the need for sophisticated SMT placement and inspection equipment. Eliminating rework, improving manufacturing processes, reducing associated costs, increasing yield and enhancing margins represent key benefits driving adoption of SMT inspection equipment. With modern day automobiles coming equipped with high-end entertainment, connectivity systems, and driver safety features, increased integration of power electronics is generating significant demand for SMT equipment in the automobile industry. As stated by the new market research report on surface mount technology (SMT) equipment, Asia-Pacific represents the single largest market worldwide. With robust pace of industrialization, infrastructure development and GDP growth, the region offers bright growth prospects. Latin America, trailing a CAGR of 7.2% over the analysis period, is projected to emerge as the fastest growing market. While growth in the SMT equipment market in Europe continues to remain subdued amidst volatile economic conditions, long term prospects remain positive with EU gearing up to revive its position in the hardware and manufacturing industry and supporting innovative startups and electronics manufacturing clusters in the region. 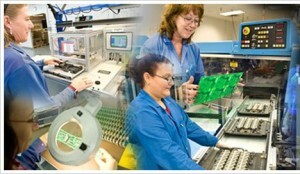 SMT placement equipment represents the largest product segment within the SMT equipment market. Growth in the segment is attributed to the burgeoning momentum and thriving product innovation in the electronics market. Though product miniaturization is the most significant factor contributing to the resurgence and subsequent buoyancy in the SMT placement equipment segment, the need for higher accuracy placement equipment, improved speed and flexibility also play vital roles in driving growth. In the SMT Inspection Systems market, Automatic X-Ray Inspection (AXI) Equipment and Automatic Optical Inspection (AOI) Equipment are expected to gain traction over next few years. AXI equipment is expected to gain from the integration of computer tomography and intuitive programming. AOI equipment is projected to benefit from machine vision-based algorithms that feature easy programming capability, flexibility, and enhanced ability to detect faults and with few false call rates. Major players in the market include ASM Assembly Systems GmbH & Co. KG, Assembléon Netherlands BV, Conceptronic, CyberOptics Corporation, Fuji Machine Manufacturing Co. Ltd., Heller Industries Inc., Juki Automation Systems Inc., Koh Young Technology Inc., Panasonic Corporation, Saki Corporation, and Universal Instruments among others. The research report titled “Surface Mount Technology (SMT) Equipment: A Global Strategic Business Report” announced by Global Industry Analysts Inc., provides a comprehensive review of market trends, issues, product innovations/introduction, mergers, acquisitions and other strategic industry activities.